Do you smell that? Hmmmm. I do. That's the smell of freshly baked RetroGamingRoundup me thinks! While UK is waiting to pull the latest show out of the oven, now is a great time to start discussing yours and our picks for favorite Video Game Marquees. Last edited by miner2049er; 24-02-12 at 05:06. Oh, and check out the differential housing on that Moon Buggy. Something doesn't look right. Great top ten, and really hard to choose. I always thought Tempest's marquee looked cool as heck, but it bothered me that it didn't really represent the game at all. I can't vote for it in good conscious given that. I never saw a Solar Fox arcade cab, just the 2600 game, but that marquee ROCKS. I wasn't planning on voting for it since I never saw one in the wild but given the pics I'm going for it. If it weren't for Solar Fox I'd have picked Moon Patrol. It looks cool and captures the game. I voted for Tempest because it's a classic marquee and I think it's the best looking one in the group. As far as representing what the game is about, the box art for the Atari 5200 version does that well. Last edited by Chewchilla; 27-02-12 at 07:29. When you think you are a tough avenger, switch the difficulty to A, and then try Ultimate Yars! Is that available yet? I was following the thread on Atari Age but it kind of fell off my radar. That looks AWESOME. Unfortunately it is not available, but it appears that work on it continues. 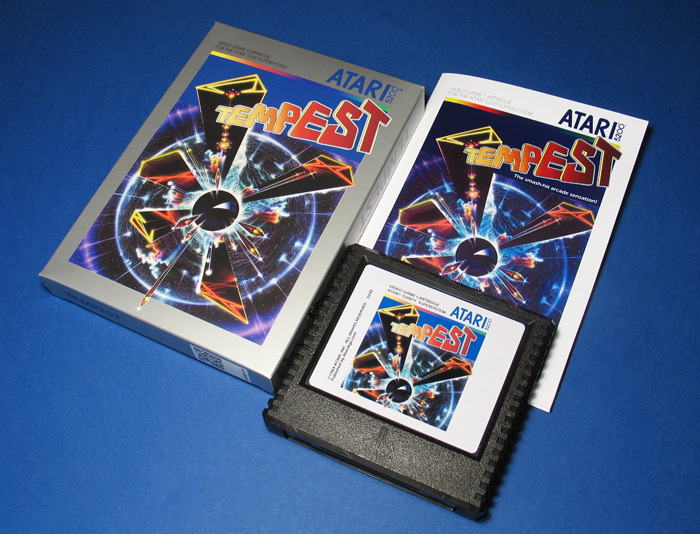 AtariAge: What happened to Tempest for the 5200? I remember playing a build of Tempest on the 5200 at CGE 2010. It's a shame that it hasn't come out yet, it played very well. After playing Sinistar on the 5200 I came away impressed with what the machine could do. Speaking of Sinistar, that would have been in my top four. I had to go with Tempest though, that marquee is insanely awesome. Makes me want to go break out the Jag. Ya, my Jag is always hooked up to my 42" and I play Tempest 2000 on there all the time. One of my all time favorite home console games. It is just SO AWESOME! I still want to get one of those homebrew Jag paddle controllers for it. Luv to play Tempest on the Jag...although it's not my favorite game on the system. I am a huge Iron Soldier fan. And of course AVP and a great port of Cannon Fodder grace the mighty Jag!